This illustration shows convoluted magnetic field lines extending out all over the sun. A new solar telescope, scheduled to launch this winter, willprobe the sun's atmosphere and inner workings, helping scientists betterunderstand how solar storms. During its five-year mission, the Earth-orbiting SolarDynamics Observatory (SDO) will seek to reveal how the sun's magnetic fieldworks, what governs the ups and downs of thesolar cycle and how solaractivity affects Earth. "The sun is a magnetic variable star that fluctuates ontimes scales ranging from a fraction of a second to billions of years,"said Madhulika Guhathakurta, lead program scientist for the Living With a Starprogram (of which SDO is a part) at NASA Headquarters in Washington, D.C."SDO will show us how variable the sun really is and reveal the underlyingphysics of solar variability." SDO will measure and observe the sun's magnetic field, whichpowers all solar activity. Flow of hot, ionized gases in the sun's convectionzone ? the region inside the sun where hot gas parcels rise and transportenergy to the surface ? act as electrical currents to generate the sun'smagnetic field. The observatory will look at the fields at the surface ofthe sun and use those measurements to infer exactly where the fields originateinside the sun and where they are expressed as active regions, such as sunspotsand coronal loops, to where they eject particles into space as coronal massejections and solarflares (both of which can impact the function of satellites and electricalgrids on Earth). 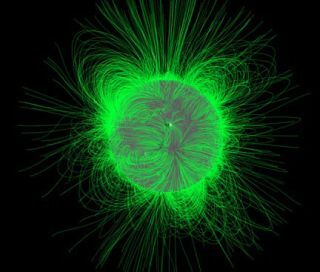 The goal is to better understand how the sun's magneticfield is generated and how its energy impacts solar radiation, which in turnaffects the rest of the solar system, including Earth. SDO will also follow changes in the sun's activity, which isknown to rise and fall on a roughly 11-year cycle. A solar cycle is at itsmaximum when the greatest number of sunspots is counted in a year; the minimumoccurs when the fewest are seen. Both of these markers can only be recognizedafter they have been passed. The potential connection between low levels of solaractivity and Earth's climate are something scientists want to better understandin the hopes that they could eventually learn to predict these ups and downs. The Helioseismic and Magnetic Imager (HMI) will peer intothe sun and map the surface of the sun's magnetic fields, as well as the plasmaflows that generate magnetic fields. The Atmospheric Imaging Assembly (AIA) will image the solaratmosphere in multiple wavelengths that cannot be seen from the ground. HMI andAIA will together link changes on the solar surface to the sun's interior. The Extreme Ultraviolet Variability Experiment (EVE) willmeasure how much energy the sun emits at extreme ultraviolet wavelengths, whichcan only be observed from space because they are completely blocked out byEarth's atmosphere. These wavelengths of light are important to study becausethey can affect astronauts out in space. SDO will watch the sun almost 24 hours a day as it orbitsthe Earth in a figure-eight path. The spacecraft will take images of the sunevery few seconds with the visual quality of an IMAX movie, giving scientistsan unprecedented look at our parent star.